"Now hear this, Goldfinger. Your luck has just changed." Includes a special display base with illuminating name plaque, a hand-tailored costume, and more! Take your James Bond collection to another level! Big Chief Studios are proud to present the James Bond 1:6 Scale Action Figure! This meticulously detailed figure of actor Sean Connery as James Bond comes with numerous accessories including a special display base with illuminating character name plaque, a hand-tailored costume, and interchangeable hands. 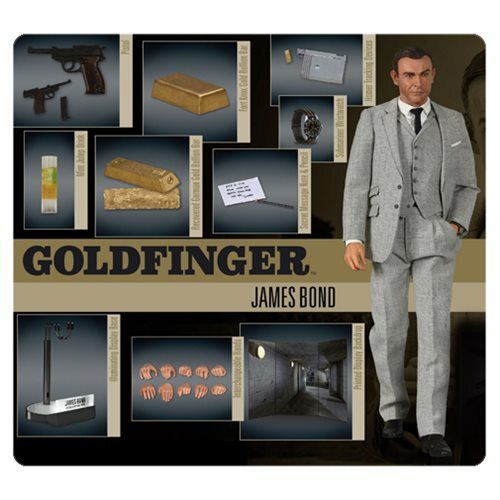 The world of James Bond comes alive with this stunning Goldfinger James Bond 1:6 Scale Action Figure! Measures approximately 12-inches tall.